Utility and decorative, the Tiffany Montpellier chandelier is perfect for your home thanks to its windows of different colors and elegance. To bring a chic and magical touch to your interior, while adopting a central and general lighting with a work of art nouveau, this magnificent chandelier Tiffany Montpellier is designed especially according to the artisanal processes of the American designer Louis Comfort Tiffany, with the same choice of materials used at the time. Composed of real solid glasses, welded with tin, assembled by hand, it meets CE and RoHs standards (lead-free and mercury-free guarantee) for the respect of the environment. Height of the shade: 22 cm - Diameter: 41 cm. You can adjust your height by removing links from the chain. You want to adopt a decorative element in itself chic and refined, the chandelier Tiffany Montpellier can decorate your interior in an original way in the day and bring a soft light and magic at night. 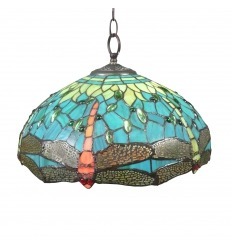 Exploited for this purpose by a creative artist of the early 1900s, this lamp Tiffany style presents a stained glass consisting of a wide range of handmade glass, decorated with dragonflies, handcrafted glasses as in the time of Louis Comfort Tiffany colors green, turquoise blue, red and cabochons with warm and precious color. Beautiful Art Deco motifs such as various geometric shapes in colorful mosaic make this elegant lighting to enhance your home. Like all luminaire categories of this style, the Tiffany Montpellier chandelier contains a hundred pieces of finely cut glass, soldered with tin on a metal structure. Clinging to the center of your room, it will be able to get you a light light that sneaks around the wings of the dragonflies thanks to the semi-translucent smooth glass. As for art deco lamps, this model is sold electrified for two bulbs of 60 watts maximum. The chandelier chain can be adjusted to a height from 105 cm to 43 cm (ceiling height - low gloss).